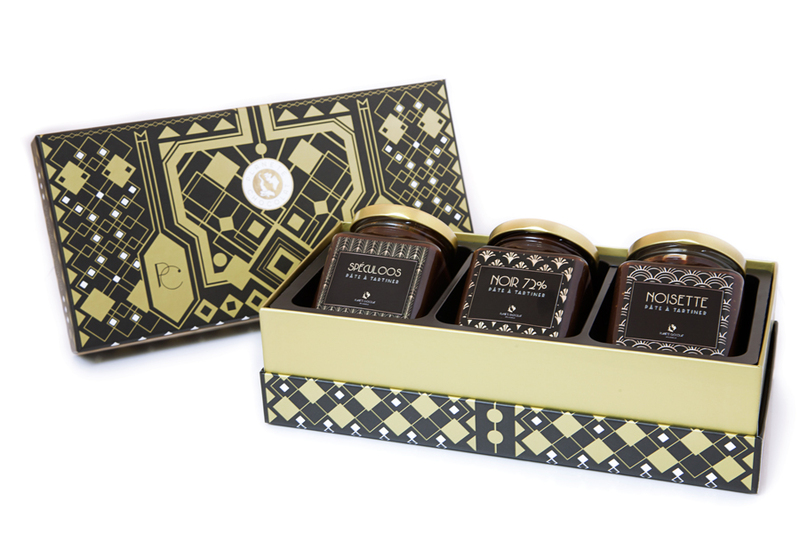 Composed of three pots of chocolate spread, this deluxe set created by our master chocolate makers was designed to bring back memories of childhood teatimes. 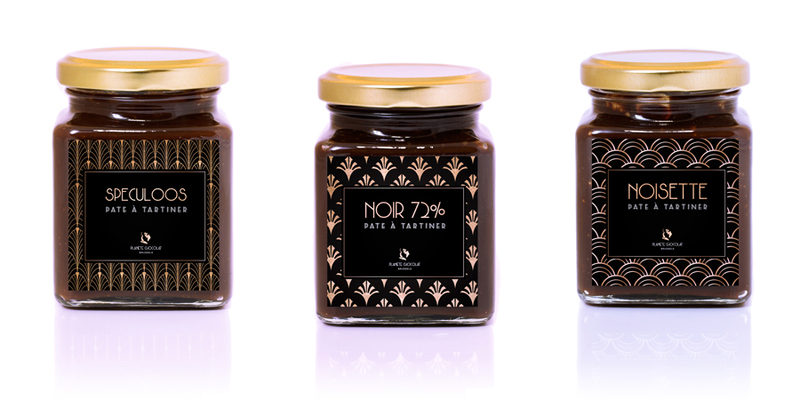 Discover new gourmet flavours made with hazelnuts, speculoos and 72% dark chocolate, which you can eat directly from the spoon, or spread on bread, waffles and crepes. The first signs of autumn tend to create a feeling of nostalgia. And when teatime arrives, many of us remember this hour in our childhood, where steaming hot chocolate was accompanied by slices of lavishly spread bread. This set was designed as a nod to these memories, while providing an update to traditional spreads. The modern feel is evidenced by a maroon and gold colour scheme and a design of symmetrical geometric forms. This little treasure box tenderly holds three pots delicately placed in their cells, each one decorated with its own symbol. Regarding taste, these handmade products have the advantage of being less sweet while retaining sought-after indulgent richness. 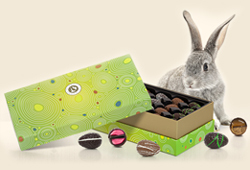 Planète Chocolat has chosen to supplement the feeling of nostalgia in air by focusing on wonder and surprise. How? By deliberately leaving in the mix little pieces of caramelized hazelnut or bits of carefully broken up speculoos which you encounter as you taste the spread. The ingredients are above all chosen for their quality and combination of flavours. For example, the powdered hazelnuts are mixed with a blend of Grand Cru chocolate (44% Vanuatu milk and 64% Peruvian fondant) which bring out the taste of the filberts. The speculoos is combined with a 43% chocolate from Venezuela and a 54% variety from Costa Rica. 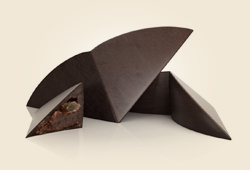 Finally, Planète Chocolat rewards lovers of intense chocolate with a third spread made of 72% dark chocolate from Ecuador, where the taste of cacao overtakes sweetness for an outrageously decadent taste.